Tanner explains that he “accidentally” fell into activism after the passage of Proposition 8, though that might be a humble interpretation of his efforts since. Before then, being gay had been easy. He came from a liberal family with open, loving parents and never had personally suffered much in the way of homophobia. He explained to me that “everything changed” when Prop 8 passed. It was an eye-opener for him and he saw the need to stand up and not be afraid. After the rallies and protests subsided, he wondered what he could then do? 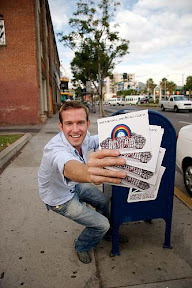 Tanner started Postcards to the President, encouraging folks all over the country to send postcards to President Obama demanding the repeal of the Defense of Marriage Act. The project exploded, and over 15,000 postcards have been sent with more on the way. Through the project, he met many more local activists with a similar desire to help and keep the conversation about these issues going. Soon he met Rick Jacobs, Cleve Jones, and was assuming leadership positions with the National Equality March (now Equality Across America). Tanner is passionate about the sustainability of the grassroots movement. When he asks himself, “What can I do?” he now knows the answer is, as Gandhi said, to be the change. We deserve better… and we can do better! The one thing Tanner would change is the struggle of class oppression that stems from greed. He hopes his efforts help humanity minimize greed, because he sees a connection from all issues back to class. Though the Rock for Equality already took place, here is its “What Kind of Planet Are We On?” video that won a YouTube Do-Gooder award for Innovation in a video. There are 1 Comments to "Faces For Equality: Tanner Efinger"